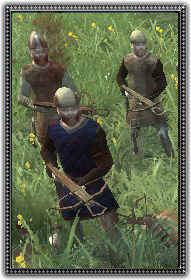 Lorrainian Crossbowmen are inexpensive militia units formed to protect settlements. Being able to train townsfolk quickly in the use of the crossbow allows these units to be garrisoned frequently and the stopping power of the crossbow can make their withering fire lethal. Poorly armoured, it is just as well crossbow militia are expected to hide behind defensive walls.